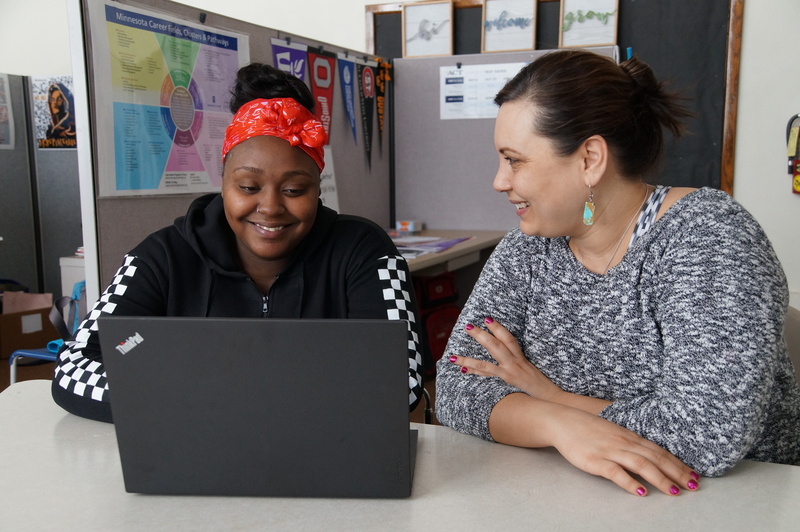 Amisha is an active student, a busy mom of two beautiful little girls, and a regular at our Career & College Center at Longfellow Alternative High School, a school that supports pregnant and parenting teens. Longfellow offers a personalized education model, an Early Learning Center that provides childcare and preschool, and other services that help students stay in school and create post-graduation plans they’re invested in and excited about. Amisha works one-on-one with our CCC Coordinator Tiffany Enriquez and also participates in our weekly CCC group, where students explore career and college options, complete college and financial aid applications, apply and prepare for Step Up internships and connect with other opportunities. With June graduation on the horizon, Amisha is planning to attend Minneapolis College or the University of Minnesota to study nursing or criminal justice this fall. First she’ll spend the summer doing her second Step Up internship in a customized program created specifically for interns who are parents.